Currently, business doers use e-commerce sites more and more. Therefore, shop owners must cooperate with suppliers to add products to their stores. With Mageplaza Import Export CMS extension, customers can transfer CMS data from this Magento 2 site to another Magento 2 site using the Import/Export function. Export cms page Fields: Admin selects the required field when exporting CMS pages. Fields that are not selected when exporting the file will not display the field and its data in the CMS page. Export cms block Fields: Admin selects the required fields when exporting CMS blocks. Fields that are not selected when exporting the file will not display the field and that field data in the CMS block. Login to the Magento Admin, choose Content> Pages> Export. This section records the information of the created pages. Click Export to make the output file you want. If left blank, no page selection will execute the entire page and the exported information will be completely based on the fields you have chosen to export the file to the page in the Export cms page Fields field at Configuration above. The contents of the exported file are based on the selected fields in the Configuration section. Login to the Magento Admin, choose Content> Pages> Import. In the Import CMS Page section, select File Type and click Download Sample File that you want to download. For each file type, the admin needs to download and edit the sample file so that it can be imported correctly. Check that the input file size does not exceed the limit shown in the message which is 5M. If the input data includes the path to the product image, the image files must be uploaded to the appropriate location. 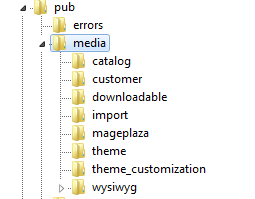 The default location on the Magento server is pub / media /. Note: In a CSV file, a comma is the default delimiter. To use a different character, make sure that the data in the CSV file matches the character you specify. If you select “File Type = XML” then the “Field separator”, “Multiple value separator” fields, “Fields enclosure” will be hidden. In the Select File to Import section, click “Choose File” to select your page input file. Note: If you select File Type = CSV (or XML), your input file must be a CSV (or XML) file correctly. After entering the above information, click “Check Data” at the top right of the popup to check if the data you entered is correct. 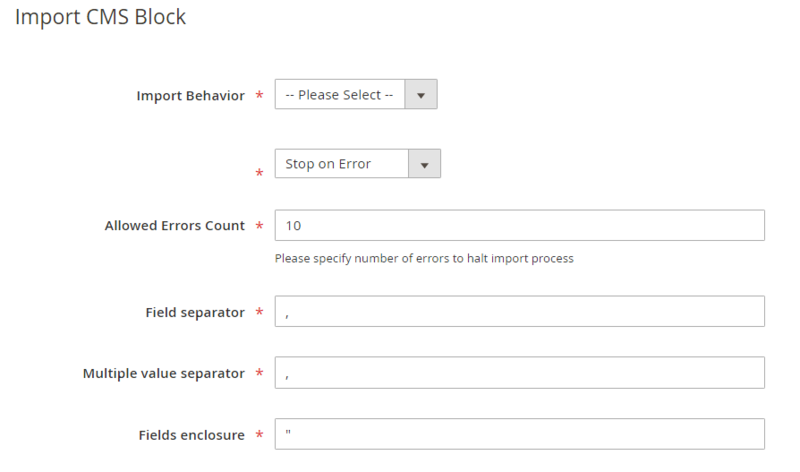 If the file is valid, click “Import” is displayed in the Validation Results section. Otherwise, if the upload file is invalid, please correct the error reported in the message and try again. 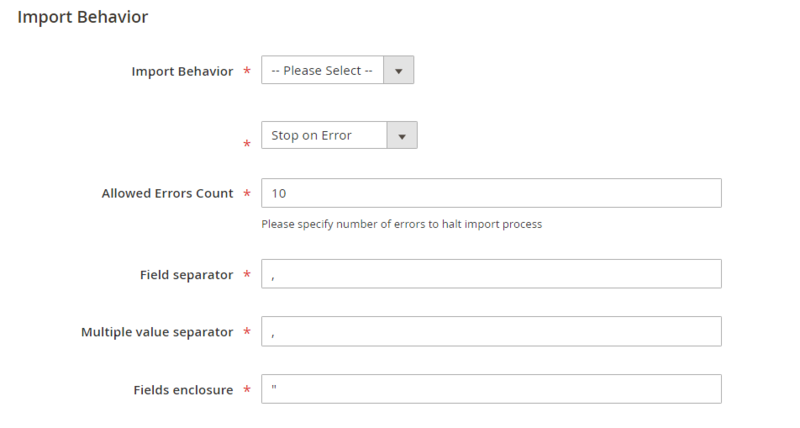 When the import process is complete, the system turn off the popup and displays your action message in addition to the grid. Example of displaying message success on grid. Login to the Magento Admin, choose Content> Blocks> Export. This section records the information of the created blocks. Click Export to make the output file you want. If left blank, no block selection will execute the entire block and the exported information will be completely based on the fields you have chosen to export the file to the block in the Export cms block Fields field at Configuration above. Login to the Magento Admin, choose Content> Blocks> Import. In the Import CMS Block section, select File Type and click Download Sample File that you want to download. In the Select File to Import section, click “Choose File” to select your block input file. If you want to delete the page (or block) format, you should switch to a file to notepad to delete the page, to avoid any information or comma that will not delete the page.